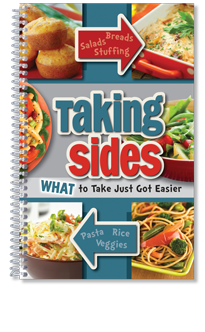 A useful cookbook for takings sides to an event or just cooking for your family. Take the drama out of taking sides with these delicious easy-travel recipes. From salads, rice and pasta dishes to vegetables, stuffings and breads, this book will help you find the perfect addition to any meal. There is something for every taste and every occasion with selections like Sweet Chipotle Spuds, Layered Mexican Salad, Cherry Ambrosia Salad and Cheesy Garlic Biscuits. Try something new or whip up an old standby; whether you’re headed to a cozy potluck dinner or adding to a bountiful buffet table, this book has you covered.